The wedding season is back and I am happy! 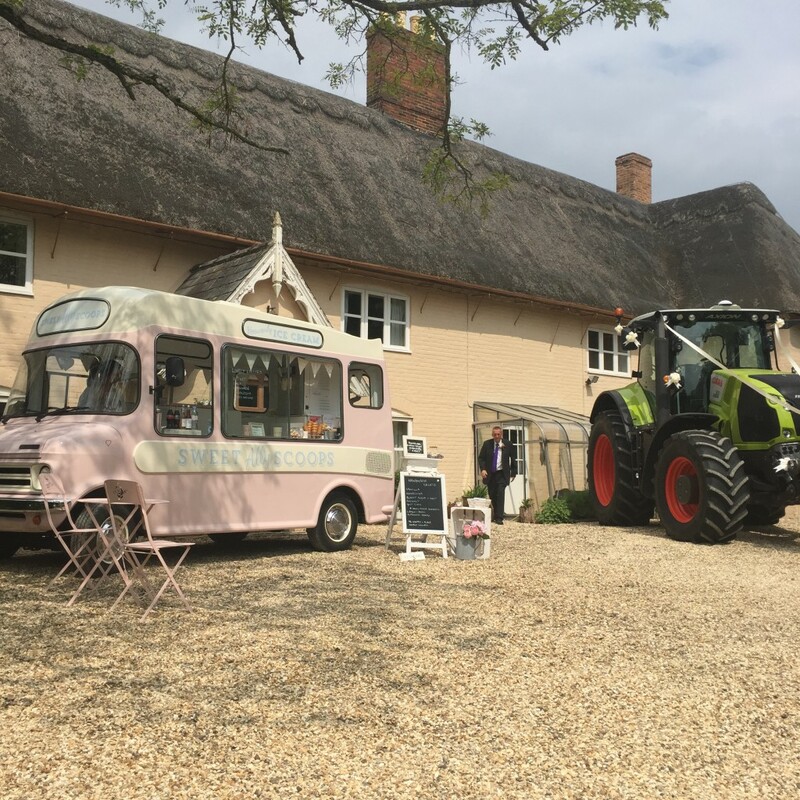 After what seemed a very long winter this year, Lottie is out of her barn and back on the road to some beautiful venues and lovely wedding couples. It’s going to be a great year as I have been booked to attend some amazing venues and different styles of wedding. I am still stocking the best gelato ever from Jack’s Gelato and I have introduced some new flavours for 2016. Honeycomb and Burnt Sugar and Salt have been really popular so far and a dairy free Lemon and Basil sorbet has been a huge hit at weddings. I was lucky that the first wedding booking of 2016 was only five miles up the road from home at the pretty Chittering Barns in Stretham. The barn can be rented for your wedding reception with the option for you to choose your caterers. I went along as dessert and Nicole and Josie had added some pretty touches to the barn and the gardens. Hay bales, blankets and a fire pit all added to the beautiful setting and rustic country feel. My next wedding was once again at one of my favourite venues Chippenham Park near Newmarket. Carly and Dean booked me after seeing Lottie and I at the wedding fair there the year before. I arrived for their evening reception and Lottie looks pretty sitting outside the large marquee. Dean was a great sport and had fun scooping a Mango Sorbet for his wife. Last year I took part in a wedding shoot with some other suppliers at Swavesey Windmill so it was great to get a wedding booking back there this year. I was booked for dessert again and scooped and dispensed for 180 guests. 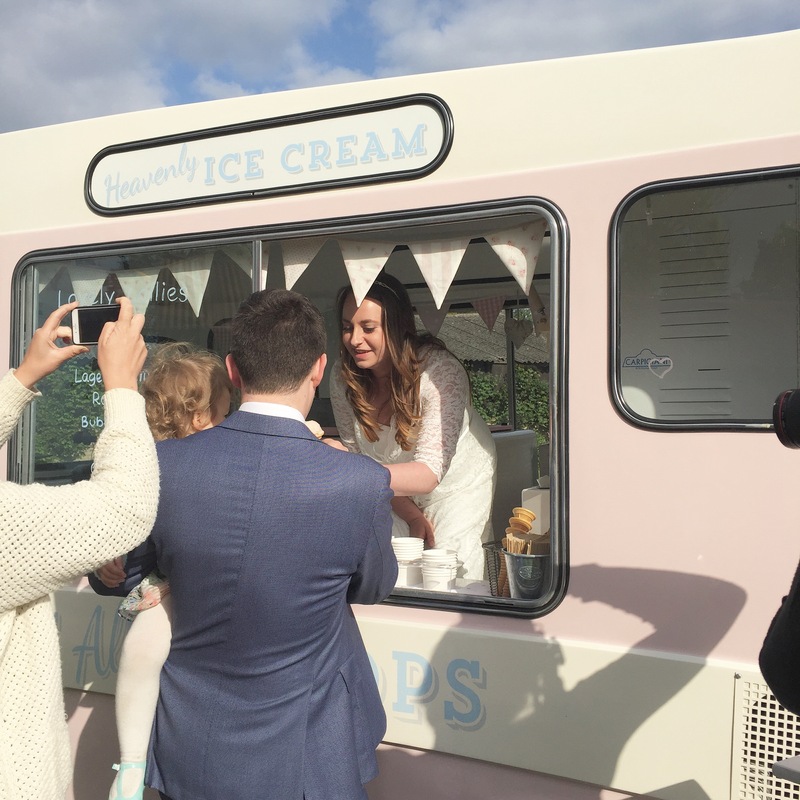 Charlotte and Sam both came aboard the van and really enjoyed scooping. I left them to it until their speed let them down and a queue started to form!! 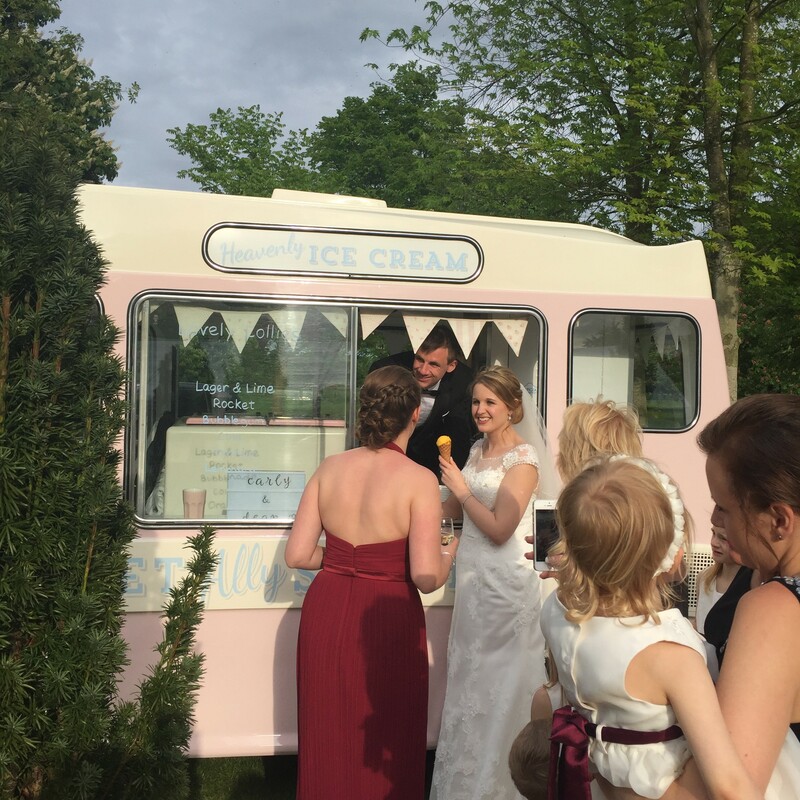 Having your wedding reception at the windmill allows you to choose your catering options and there is a bar area to keep all your guests refreshed. The gardens are beautiful with a really pretty lake and bridge. Have a look at their website for all the information and some more pictures. My final two weddings this month were both on a Saturday. I attended the first one in the afternoon in Suffolk and scooped for the day guests and then the evening guests as they arrived. Jess and Robert were adorable and had a marquee in the very large and beautiful garden of Robert’s boss! I parked next to the thatched farmhouse and got a big shock when a huge brand new tractor parked up alongside me! Robert is a farmer and is now also fully trained in dispensing a “99”! 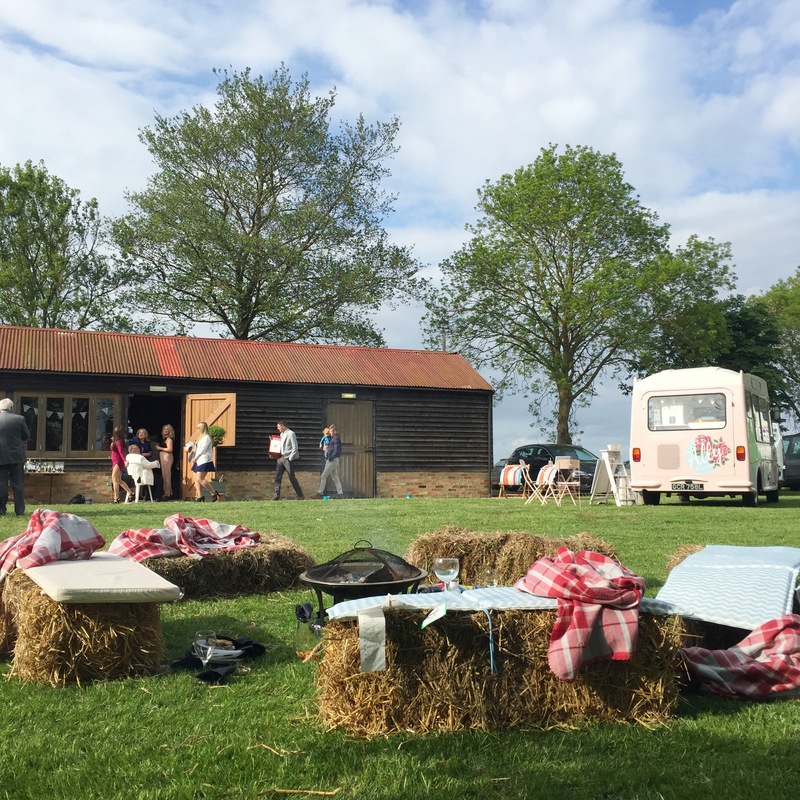 Hay bales and blankets were a popular choice again at this wedding and lots of little shabby chic touches all around. After the evening guests had arrived I dashed off to my next booking at Little Downham village hall where Nicola and Jonathan were enjoying their wedding reception. 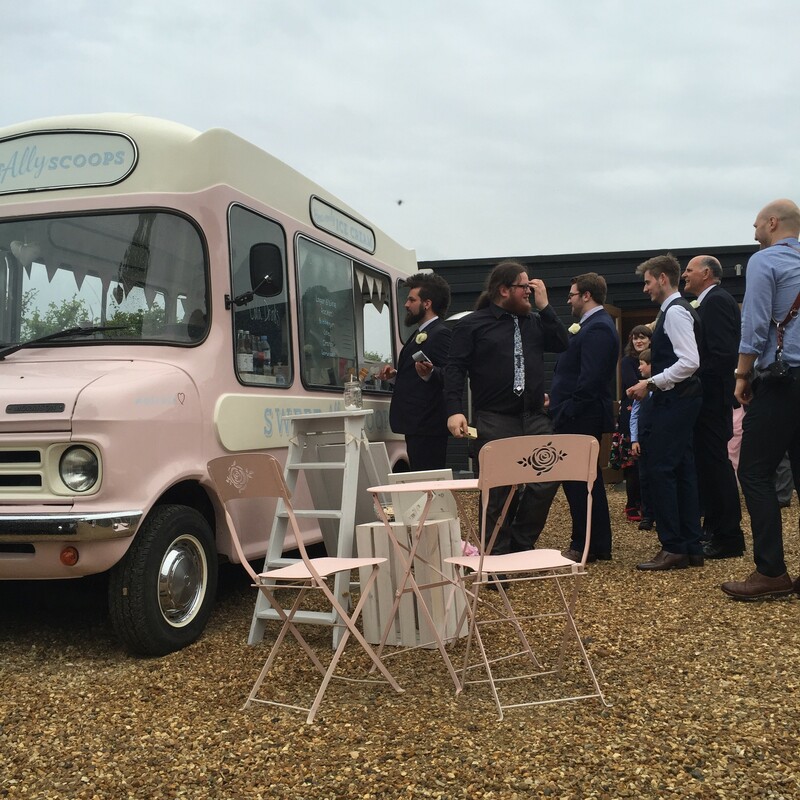 The bride and groom treated their guests to a BBQ followed by an ice cream. 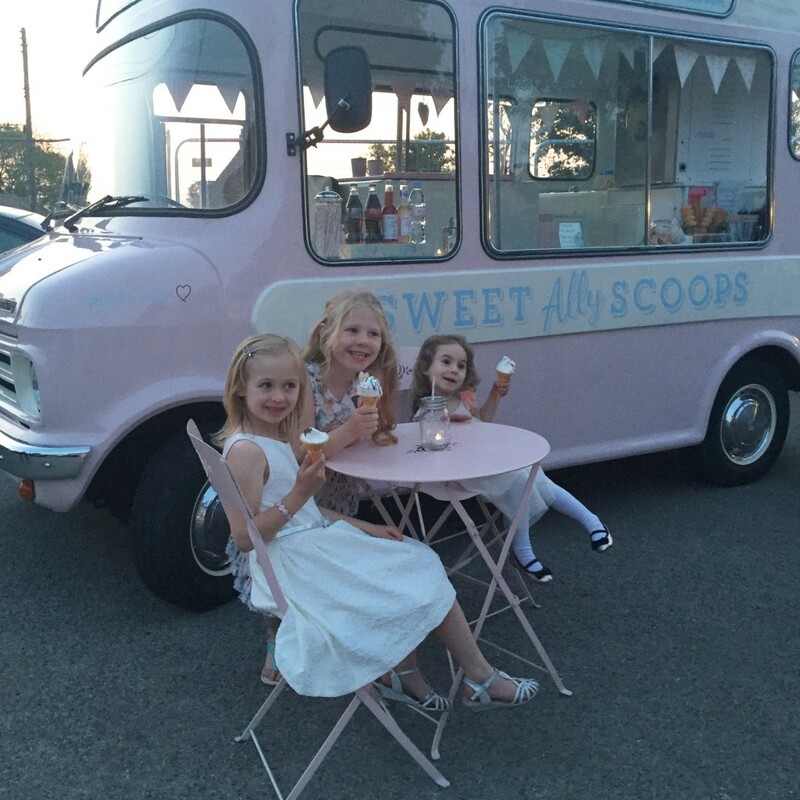 I has three adorable little girls very excited by Lottie’s attendance and I think they overdosed on ice cream just a bit!! I am so grateful to all the wedding couples and their families or friends for booking Lottie and I and allowing us to be a part of such amazing special wedding days. I LOVE weddings! !